Giza is the most famous and popular Memphite necropolis, on the outskirts of Cairo, with its three great pyramids and the mysterious Sphinx. It was Khufu (Cheops) the son of Snofru, who inaugurated the necropolis of Giza, which in ancient times was called Rosetau, situated on a desert plateau that is now surrounded to the north and east by the southern quarters of Cairo. In antiquity the Giza plateau lay in the immediate vicinity of the Nile, to which it was connected via a network of canals and basins that washed the causeways of the valley temples of the pyramids. Thousands of persons – workmen, artisans, and artists lived on this site, whose structures were recently discovered. At Giza, Khufu built the largest pyramid in the world. His example was followed by two of his successors, Khafre (Chephren) and Menkaure (Mycerinus), thus increasing the fame of Giza, the pyramids of which were considered one of the Seven Wonders of the Ancient world. In more recent times the necropolis of Giza was made part of UNECO’s Heritage of Humanity list. The new Egyptian Museum is now built a short distance from the archaeological area of Giza and when inaugurated will house the most important objects now on display in the present-day museum in Cairo. 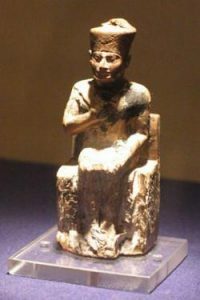 The ivory statuette from Abydos (7.6 cm) is the only existing image of Khufu (Cheops) and it is on display at the Egyptian Museum in Tahrir square, Cairo. Ground floor. The largest monument in four thousand years of ancient Egyptian history, the pyramid of Khufu was built in a twenty-year period by 20,000-30.000 workmen. Khufu, whom the ancient Greeks called Cheops, was the pharaoh who succeeded Snofru, the founder of the 4th Dynasty who built two large pyramids in the Dahshur necropolis, about twenty kilometers south of Giza. The Pyramid of Khufu is the oldest one at Giza and is so large it could contain St. Peter’s Basilica in Rome. Napoleon, who was a mathematics enthusiast, calculated that the blocks of stone used to build this colossal monument would have been enough to erect a wall two meters high and 30 centimeters thick all around France. Because of an optical illusion created by the different inclination of the faces of the three pyramids at Giza and by the different ground level, one gets the impression that the Pyramid of Khafre (built on a slightly elevated position) is the largest; however, the Pyramid of Khufu is actually larger than any other. Over 2,500,000 blocks of stone, with an average weight of 2.5 tons, extracted at a quarry only a few hundred meters south of the pyramid itself, and about 20,000 – 30,000 workmen were needed to build this colossal structure. Since the first official act of a pharaoh was to announce the beginning of work on the construction of his tomb, and since Khufu reigned for about 23 years, it must have taken at least 20 years to build this monument. As for the date when work on the pyramid began, an English scholar recently theorized that it was oriented on the basis of the alignment of two stars, Kochab and Mizar, which, according to his calculations, occurred in 2467 B.C. The deviation of three minutes from true North was supposedly not the result of an error in calculation but rather due to the actual cyclical movement these two stars describe, a movement that lasts 26,000 years. Bearing in mind this deviation, the pyramid would have been built in 2478 B.C. 76 years earlier than the traditional date ascribed to the pyramid, while those of Khafre and Menkaure were probably built in 2446 and 2413 B.C. respectively. It is not clear what led Khufu to abandon Dahshur, the site his father Snofru had chosen as his eternal abode, in favor of Rosetau, as the necropolis of Giza was called at the time, but religious motives certainly played a role here. Once the ideal site was chosen on the basis of astronomers’ calculations, the pharaoh’s architects had a basin excavated and fitted with a pier and other port facilities. A canal connected this with the Nile so that building material could be transported from distant quarries, and a causeway (remains of which were recently discovered) was built to connect the basin and the pyramid construction area. Other teams of workmen extracted limestone from a deposit few hundred meters south of Giza then cut the large blocks of stone that would constitute the core of the structure. As the pyramid grew in height, the inner chambers were built in keeping with a complex plan that called for innovative technical and architectural solutions. The ascending passageway after the entrance leads to the so-called Grand Gallery, with angled, corbelled walls, which is considered a masterpiece of ancient architecture. This in turn gives access to the pharaoh’s burial chamber, the entrance of which was protected by a granite portcullis closure system. The pharaoh’s chamber, which housed the sarcophagus, was built with gigantic blocks of red granite from Aswan, over 600 kilometers south of Giza. For the first time in the history of ancient Egyptian architecture the ceiling of this chamber was flat, and not a pitched vault and it was made of blocks weighing over 70 tons. Over this the architects built a complex network of empty spaces known as relieving chambers to prevent the structure from collapsing. Besides the king’s burial chamber, the pyramid had two other underground chambers: the so-called queen’s chamber, which probably housed a statue of the royal ka (the immaterial double of the deceased king), and the subterranean chamber, hewn out of the rock of the Giza plateau under the foundation of the pyramid itself, which may have symbolized the abode of the god Sokar. Two tunnels, improperly called air shafts, started off from the king’s and queen’s chambers; they were aligned with the Orion constellation and the circumpolar stars, which served to facilitate the heavenly ascent of the pharaoh’s soul. The pyramid was then covered with slabs of white Tura limestone; this casing has unfortunately now gone. Khufu’s royal bark, which was found intact after 4,500 years, illustrates the high level of naval technology attained in Egypt in the 3rd millennium B.C. In 1954 archaeologists discovered, on the southern side of the Pyramid of Khufu, two pits hermetically sealed with large blocks of limestone that weighed about twenty tons each. The eastern pit was opened. It contained a splendid boat entirely dismantled in 1,224 pieces of Lebanese cedar wood. Thanks to painstaking work that lasted fourteen years, in 1968 the boat was reassembled in museum built especially to house it, a few meters from the pit in which it had been found. What is more, just as when the boat was originally constructed, this operation was carried out without using a single nail or other metal piece, as hemp ropes were used in an ingenious system to put the planking together. The boat is 43,4 meters long and 5.6 meters wide and was used for river navigation, as can be seen by its slight draft. It was not a sailboat but was propelled by ten oars and steered by a double stern rudder. The bark belonged to a fleet that was part of the pharaoh’s funerary equipment. On the east side of the pyramid are five large pits ـــ opened and pillaged already in antiquity ـــ that originally contained one boat each. Most probably these boats had a symbolic meaning: just as the sun god Re crossed the sky every day aboard his solar boat, the pharaoh’s soul joined his divine father and navigated with him in eternity.